Today, telecommunication providers in Papua New Guinea (PNG) are to start deactivating unregistered mobile phones in urban centres. This follows yesterday’s deadline for mandatory mobile phone Subscriber Identity Module (SIM) card registration. The country is now to be divided into three kinds of geographies, which will be handled differently. Unregistered SIM cards in urban areas (cities and provincial capitals) will be deactivated. Users in those places will have 30 days to reclaim their phone numbers. Mobile phone users in district towns will have until December 31 to register their SIM cards, while consumers in rural areas will have until April 30 next year. The regulator has indicated that the cost of re-registering a SIM card in urban areas is to be determined by the telecommunication companies. However, telecommunication companies must ensure that SIM card registration in district towns and rural areas remains free-of-charge until the respective deadlines in those localities. President of Karkar Local Level Government in Madang Province, Mr Ben Naing, says that a team from Digicel has visited Karkar Island on two occasions to register mobile phone users. The team visited several key locations on the island, such as Kinim Station. Ward councillors, village recorders and other village leaders actively encouraged people to register their SIM cards. Earlier research in Mr Naing’s village shortly after mobile network coverage reached the island found that villagers viewed mobile service as potentially life-saving during medical emergencies such as childbirth complications. Mr Naing is confident that many people on the island have been able to register their SIM cards, although he fears that those in more remote parts of Madang Province may not have been able to. A similar story has been described by Mr Emil Yambel, President of the Basamuk Sports Association, and an employee in the Information Technology section of the Ramu Nickel mine. Mr Yambel says that a Digicel team travelled to Basamuk, with transportation and accommodation provided by the company. He said that the mine’s employees and some villagers registered their SIM cards. However, he is concerned that people who live in the surrounding mountain villages are unlikely to have registered their SIM cards. PNG is not the only country to have legislated for compulsory SIM card registration and then granted multiple extensions of deadlines. For instance, a similar process has been conducted in Uganda, and this year it has involved the writing of new guidelines, criticisms of strict measures, and then an easing of those measures. Early this year, the regulator in Uganda banned informal sellers from selling airtime (mobile phone credit) in an effort to enhance cybersecurity. Such informal activities are common in PNG and are important income-earners for vendors and key elements in social security networks for many people. However, a key difference between Uganda and PNG is that Uganda has a national identification system and mobile operators are able to confirm a user’s identity by interfacing with the national database. In PNG, a national identification scheme has been sluggish and has only reached a fraction of the country’s population. Numerous countries in Africa have introduced compulsory SIM card registration. According to Dr Alison Gillwald, Executive Director at Research ICT Africa, this process has been “counterproductive”, locking poor people out of mobile phone ownership and apparently having minimal impact on terrorism and crime. Dr Gillwald has argued that “despite little evidence that mandatory SIM registration contributes to safeguarding our digital security or physical safety, it has become a universal regulatory standard in Africa to facilitate the monitoring and interception of communications”. If, as Dr Gillwald asserts, enforcement of SIM card registration has had negative effects, especially regarding poor people’s access to mobile phones on the African continent, then it is difficult to understand how the results in PNG will be any different. Madang MP Bryan Kramer filed proceedings in court yesterday, attempting to secure a stay order to prevent deactivation of SIM cards, but this was denied. Dr. Amanda H A Watson is a Lecturer at the Development Policy Centre, based at the University of Papua New Guinea (UPNG) where she is a Visiting Lecturer in Public Policy as part of the ANU-UPNG partnership. 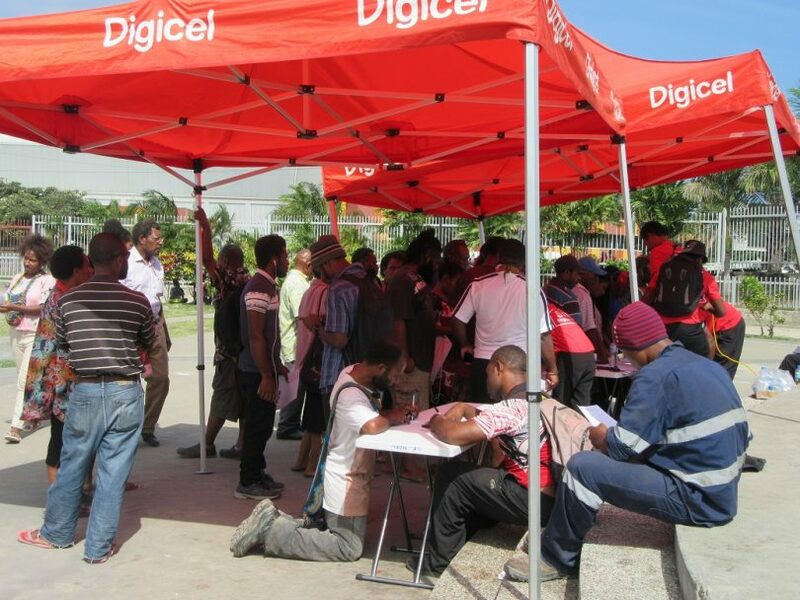 January 1st this year was to be the cut-off date for mobile phone users in district towns in PNG to register their mobile phone SIM cards, or face deactivation. Have any readers had their phones deactivated? Or heard of anyone’s phone being deactivated? District towns on the list for deactivation at the start of this year included Arawa and Buin in the Autonomous Region of Bougainville, Chuave and Kerowagi in Chimbu Province, Bogia and Gusap in Madang Province, Namatanai in New Ireland Province, Malalaua in Gulf Province, and similarly sized district centres in most other provinces. January 1st 2019 was also the cut-off date for provincial centres Wabag (Enga Province), Tari (Hela Province) and Mendi (Southern Highlands). These three provincial towns had been given five extra months for registration due to the substantial disruption caused by a huge earthquake early in 2018. Rural and remote users have until May 1st this year to register their mobile phone SIM cards before their phones are deactivated. I think this staged approach to deactivations seems to be a good idea. It has certainly given rural and remote users more time to register. It will be interesting to see how many phones are deactivated on May 1st. Experiences and thoughts of readers and mobile phone users would be welcome. It seems evident from the African experience – and Dr. Gillwald’s comments – that this policy will have little effect on crime or security, but *will* make it easier to monitor (and possibly suppress) online dissent. It’s hard to see how this benefits citizens. Even worse – although a delay has been granted for rural areas, it’s almost certain that one effect will be to make connectivity and access more difficult for those who live in remote locations. This would effectively erase one of the most important benefits of telecommunications for PNG. Very well presented on SIM Card deactivation process going on here in Papua New Guinea. From my perspective I still see a need for Telecomunication Companies and NICTA to do more awareness to the rural population in the remote parts of this country so that the people are well informed and aware of it. Simcard registration yields dividends, however, it has associated with challenges. Uganda embarked on Sim card registration nearly five years ago but the exercise was delayed until the government introduced national identity cards in 2014 for clear identification of customers. Apart from managing security – which was the major objective of the exercise – telecom firms are now better positioned to offer numerous services including micro-credit to customers without asking for collateral because they know their customers well. The Uganda Communications Commission(UCC) and telecom firms are now able to trace individuals who commit crimes using their mobile phones. With Simcard registration, SIM card boxing or grey traffic which involves incoming international calls into the country without paying excise duties to the government, has reduced as fraudsters now fear that they can easily be netted. UCC has engaged the operators and advised them to buy Fraud Management and Revenue Assurance Software which both MTN and Airtel have done to be able to dismantle SIM card boxing,” he said. “The other players are expected to do the same. The introduction of social media and mobile money tax in Uganda has however, downplayed the realization of Simcard registration dividends.